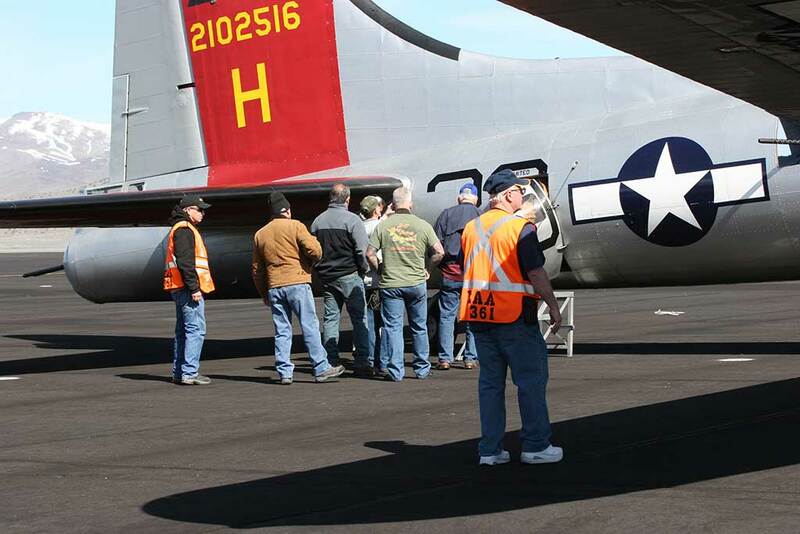 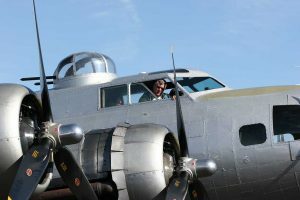 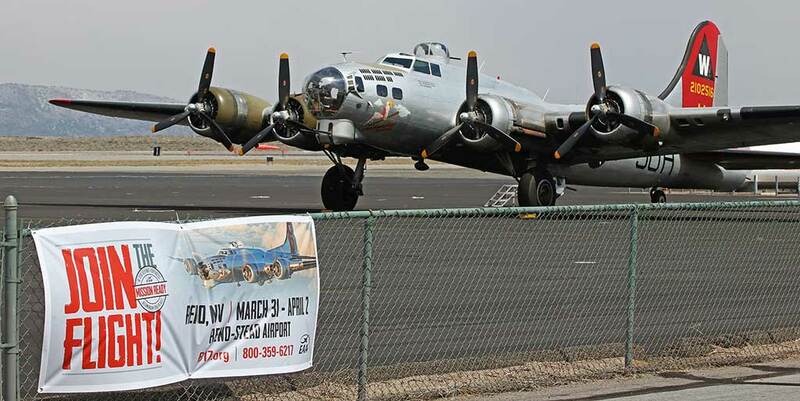 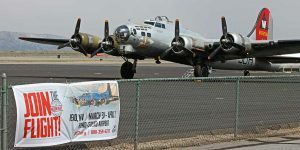 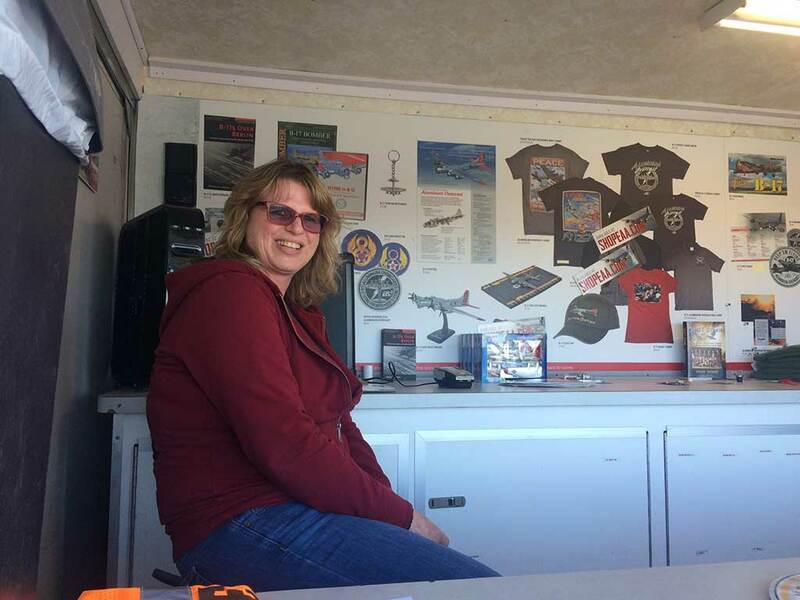 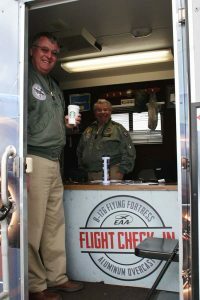 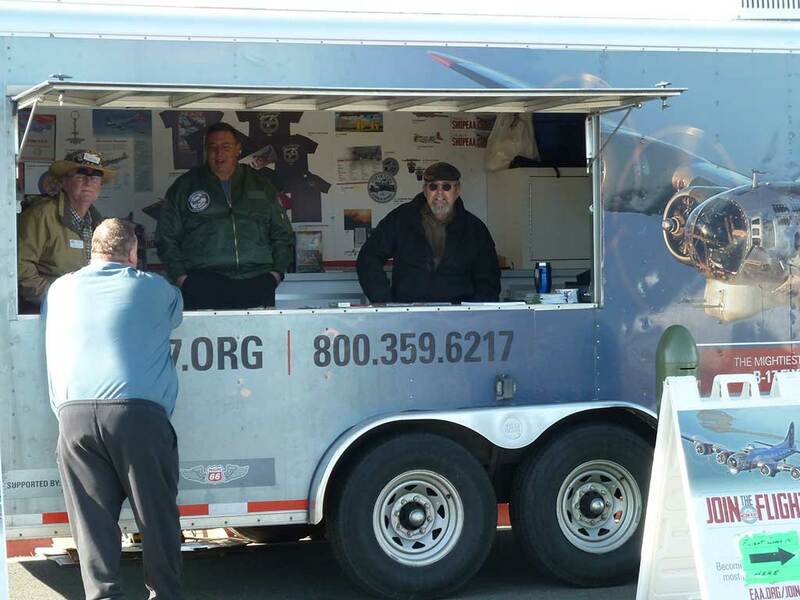 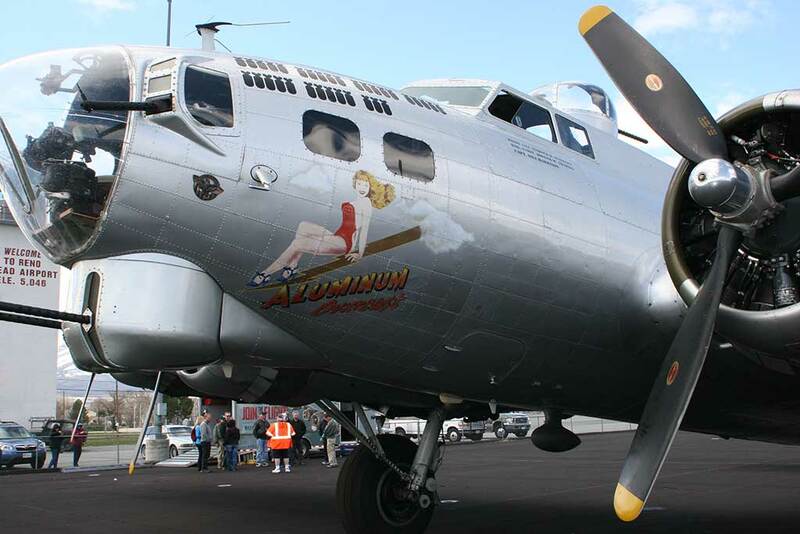 You are here: Home / Chapter Events / Everybody Enjoyed the B-17 Tour Event! 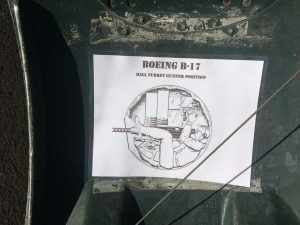 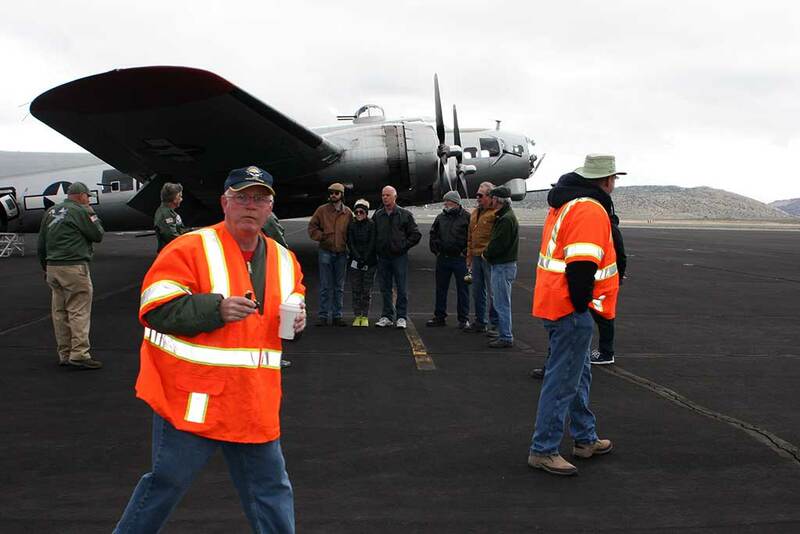 Everybody Enjoyed the B-17 Tour Event! 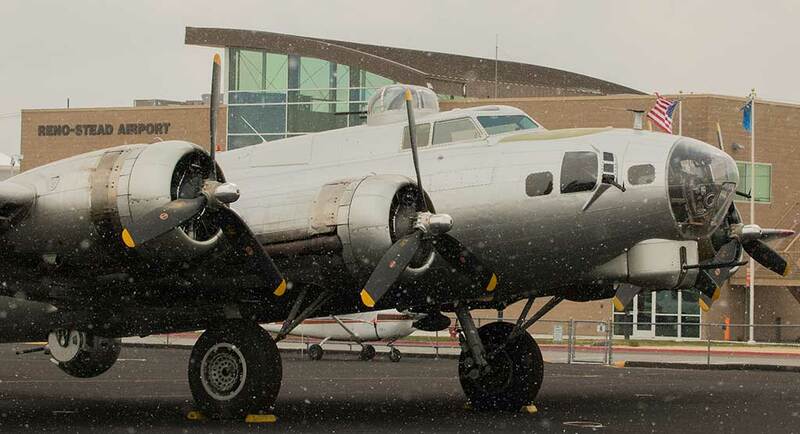 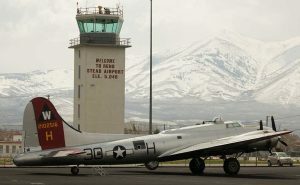 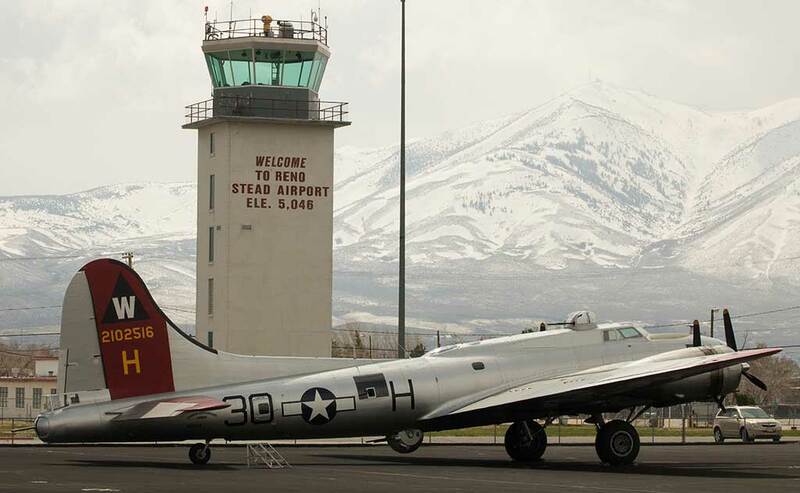 EAA’s Boeing B-17G “Aluminum Overcast” arrived at the Reno-Stead Airport through a cloud of snow flakes. 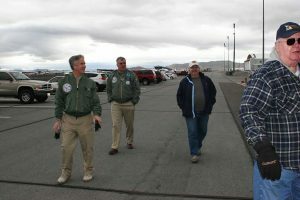 It was a cold and windy day and a rude awakening for the crew arriving after a nice warm stay at the Napa. 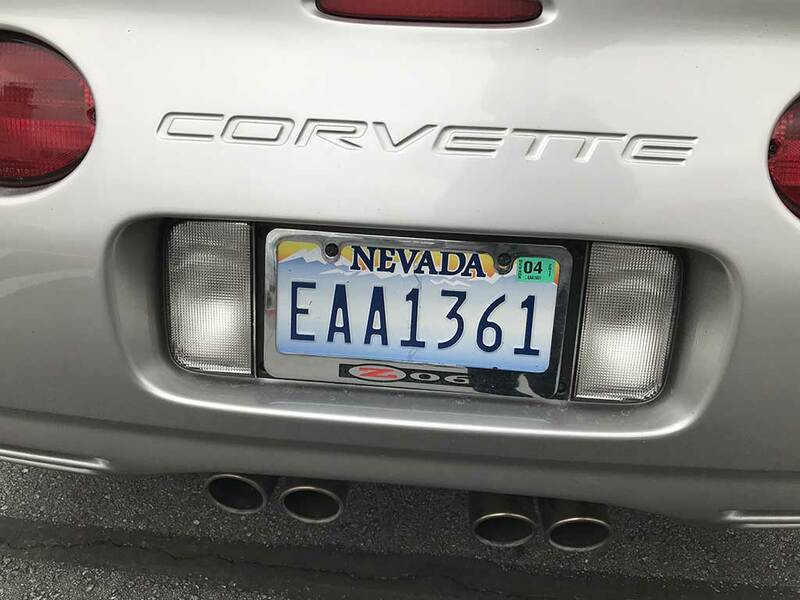 CA airport. The weather that day was just not suitable for passenger flying so the media flight was postponed until Friday afternoon. 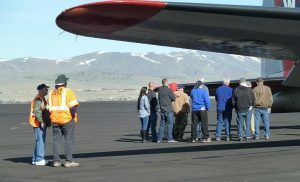 Friday dawned with nicer weather though it was still a bit cold and the afternoon turned a bit breezy, as it does often in Reno. 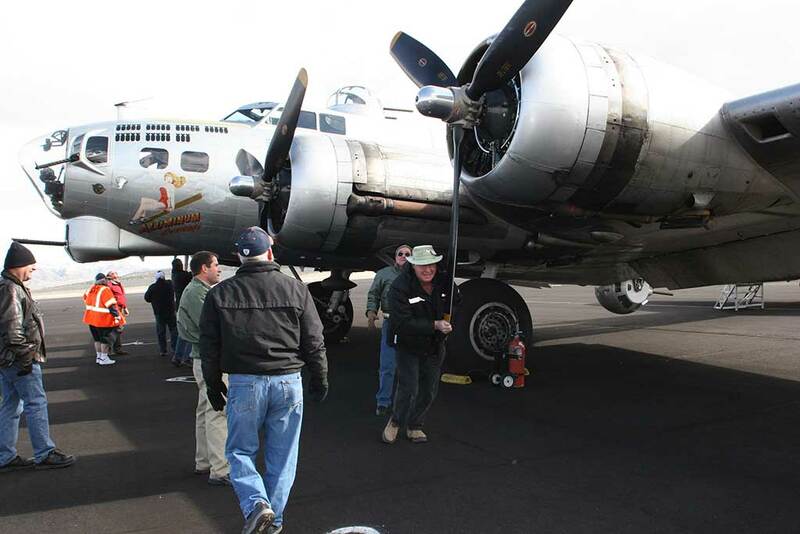 Even so, the B-17 made four flights with passengers. 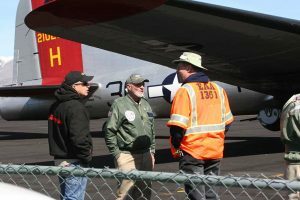 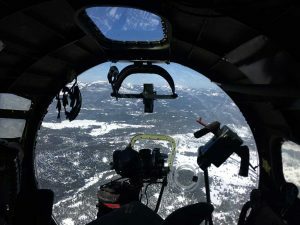 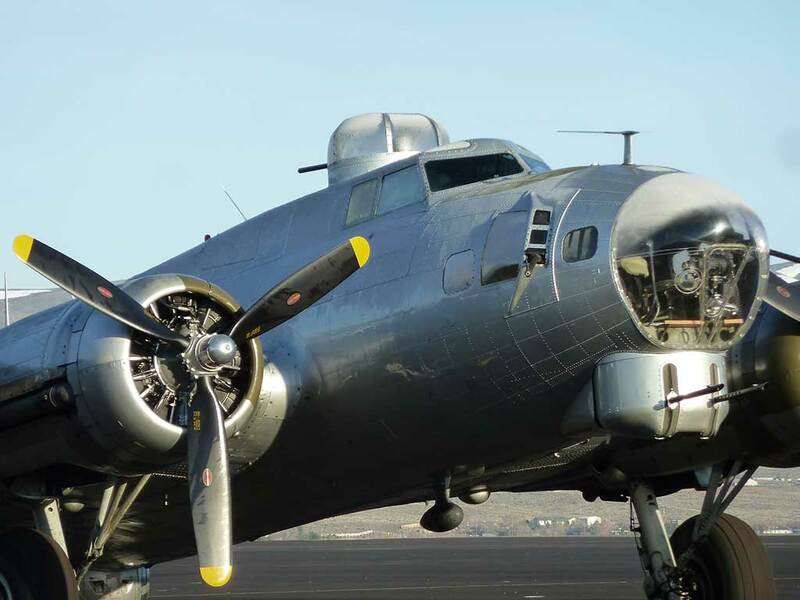 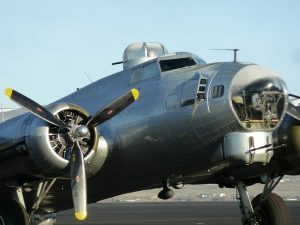 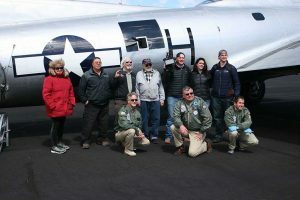 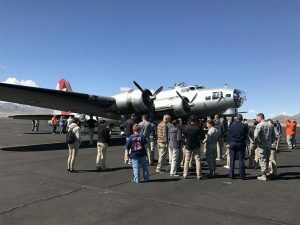 The last flight of the day was the media flight filmed and then broadcast by the crew from Reno’s Channel 4 TV (KRNV) – which included a marriage proposal (and acceptance) in the nose of the B-17 during the flight. 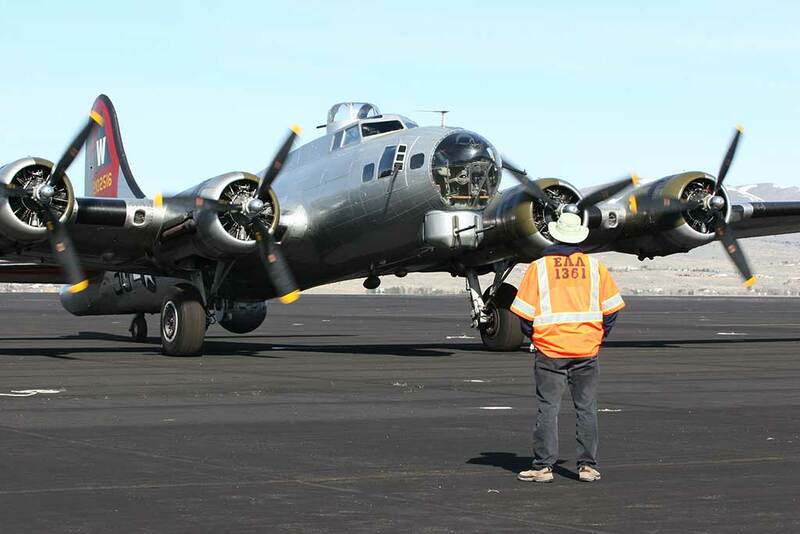 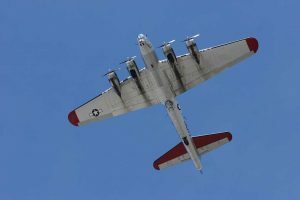 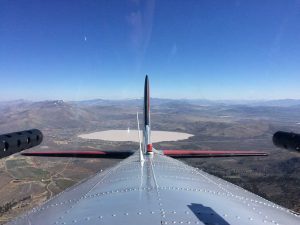 Saturday was an even nicer day, weather-wise and the B-17 made another three flights over the Reno area. 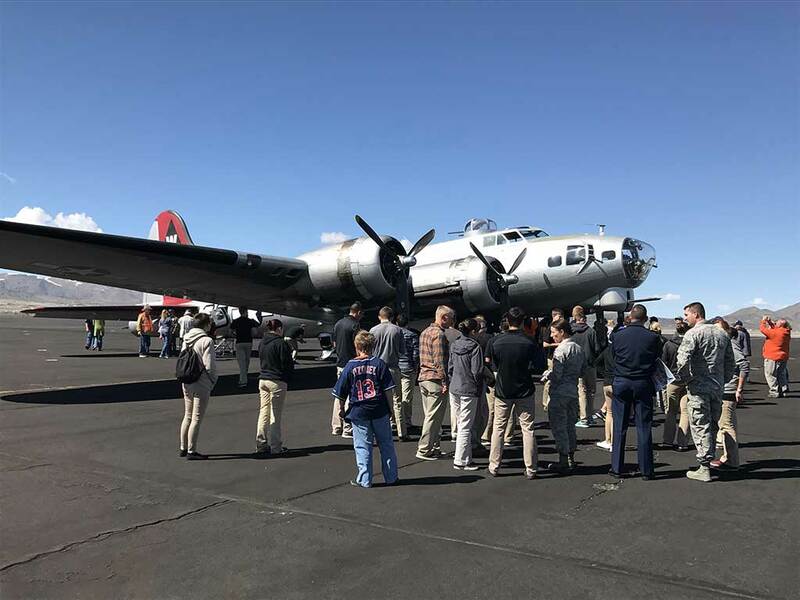 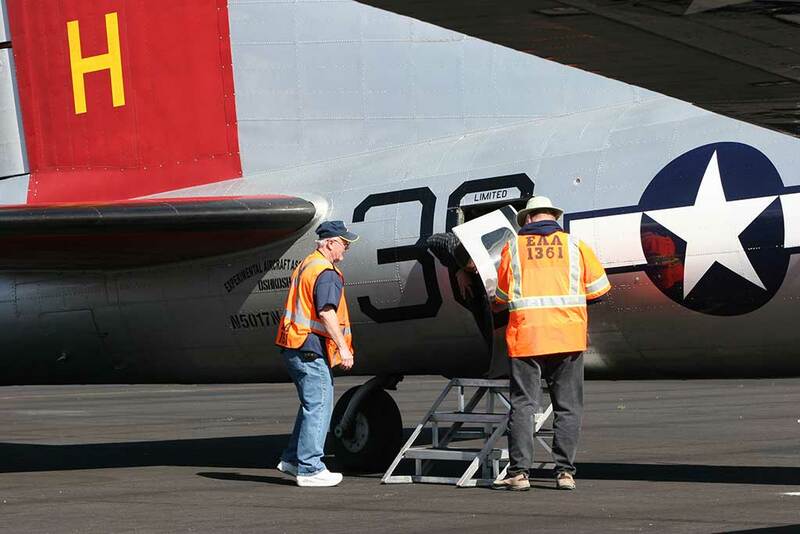 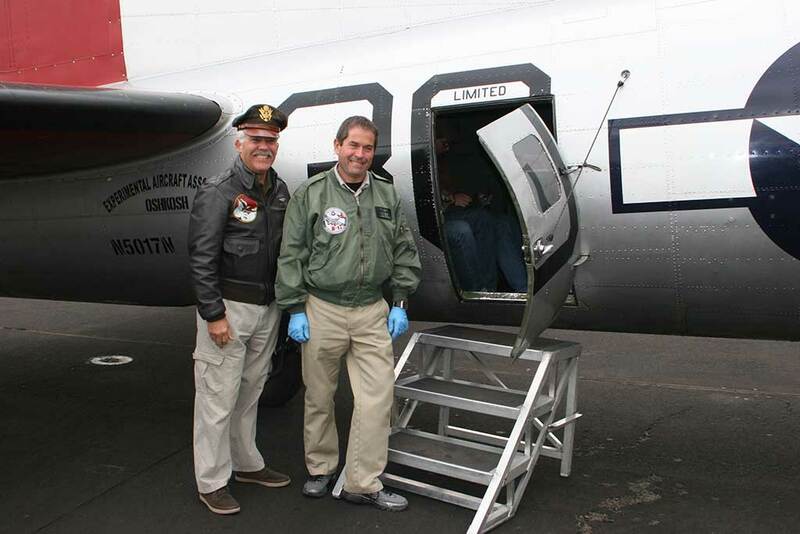 Sunday was the final day of the tour with another 4 flights full of passengers experiencing the B-17, including a WWII veteran who served as a B-17 bombardier. 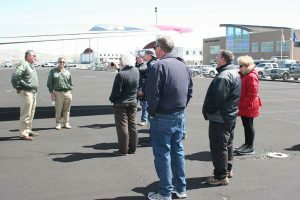 Ground tours of the aircraft were available each day after the last flight. 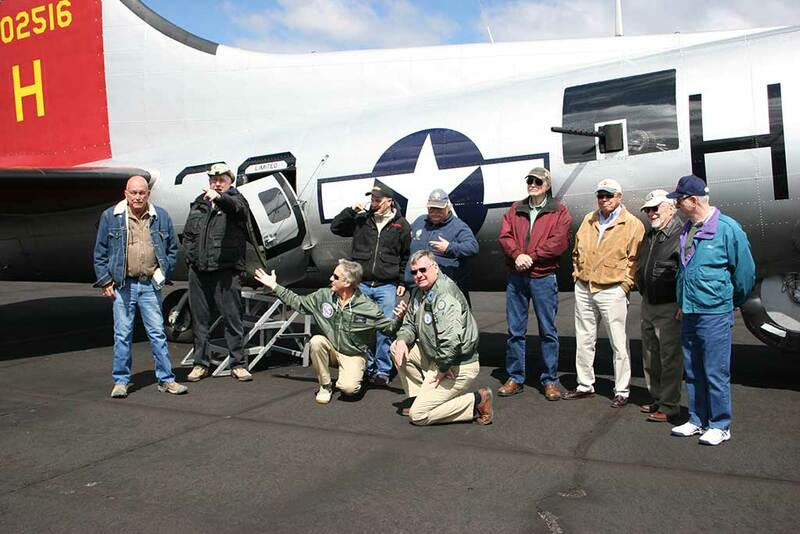 The tour was free to active duty and retired military personnel. 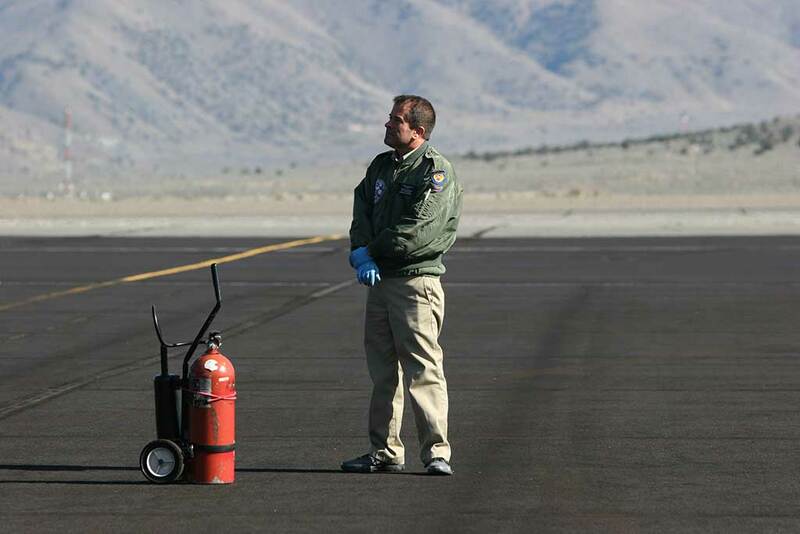 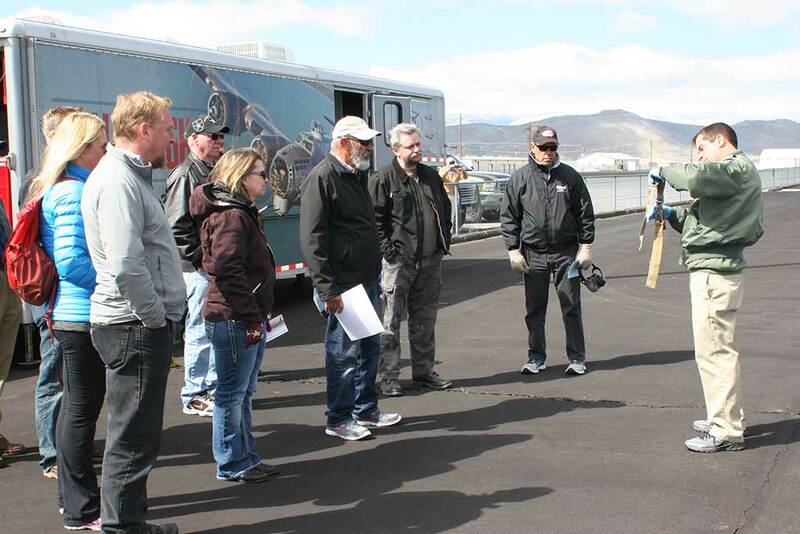 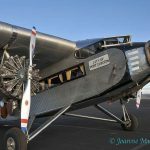 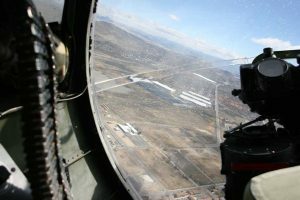 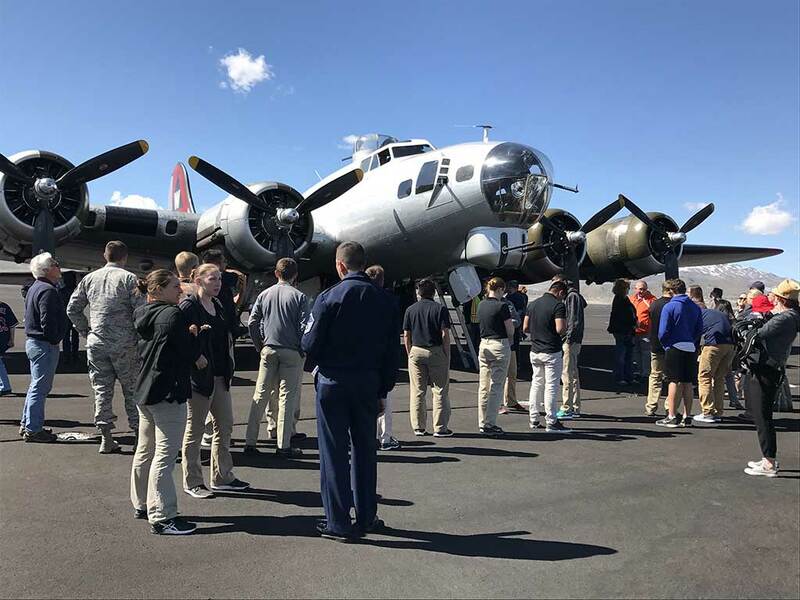 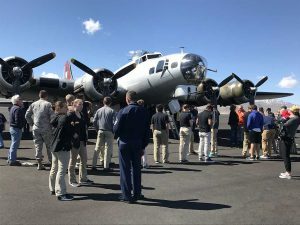 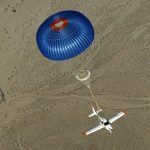 The Nevada Air National Guard brought a busload of new recruits out to experience how military flying used to be. 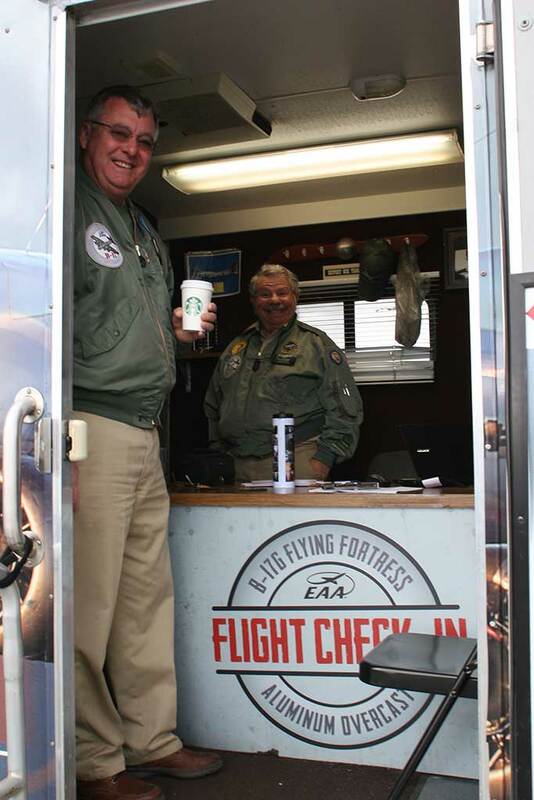 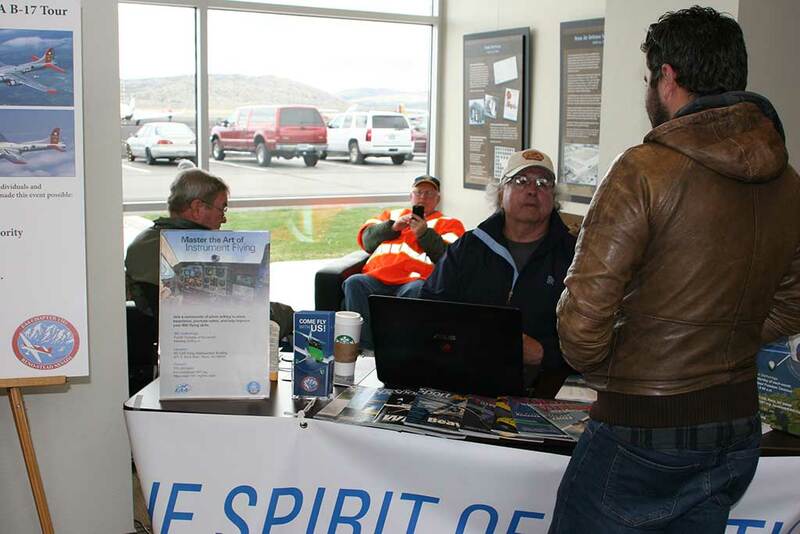 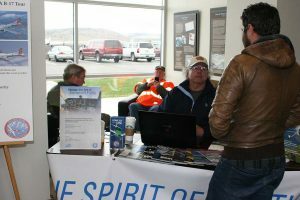 The Chapter volunteers had a great time interacting with the EAA crew and the public attendees throughout the weekend. 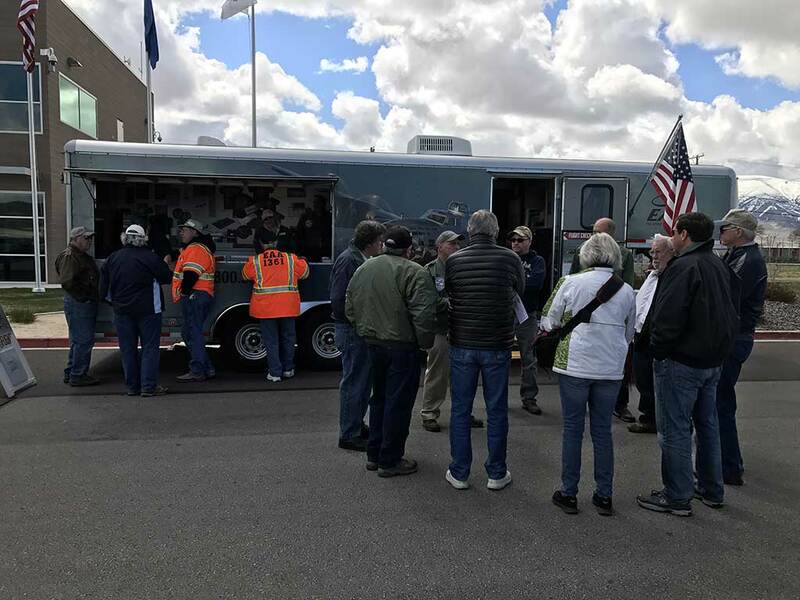 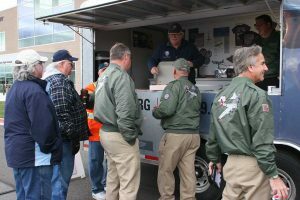 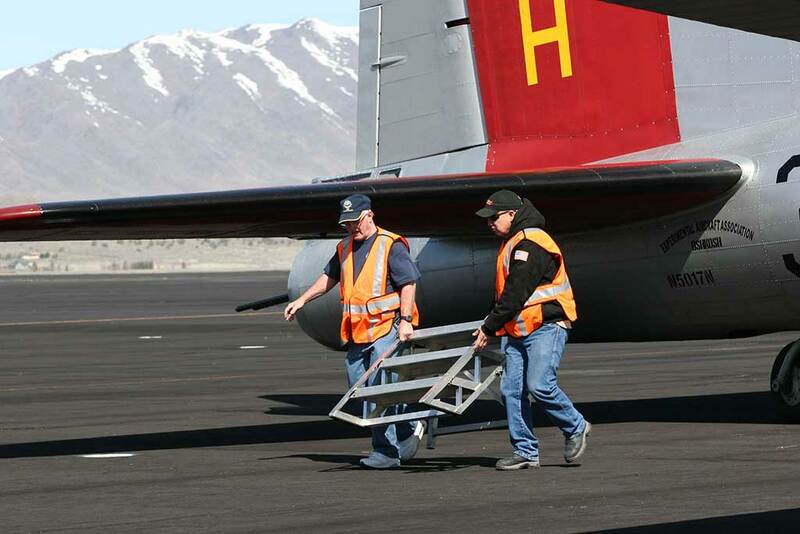 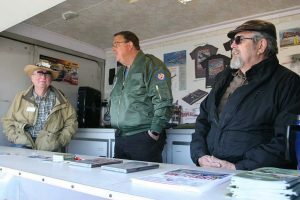 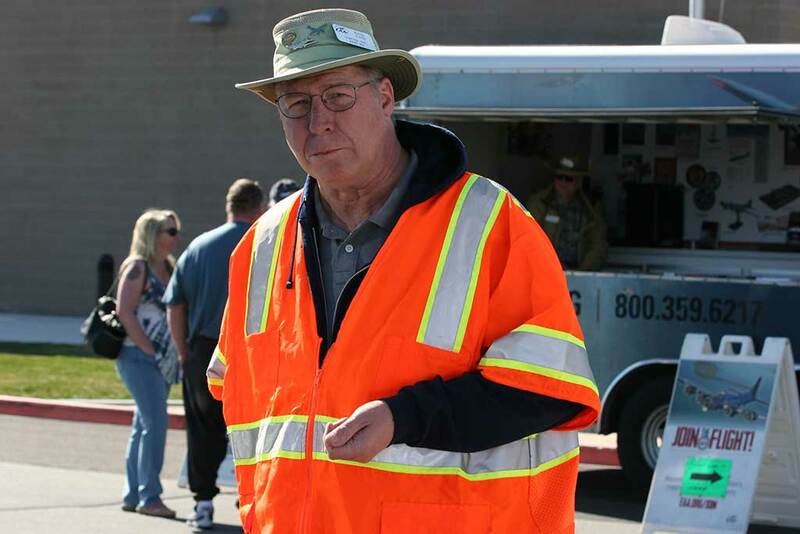 Chapter members helped with loading and offloading passengers, marshaling the aircraft into and out of its parking location and worked in the merchandise trailer selling souvenir items and ground tour tickets. 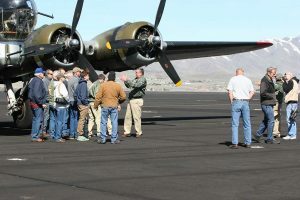 Chapter 1361 is very grateful to the sponsors who made the event possible: the Reno-Tahoe Airport Authority, the Reno-Stead Airport, Aviation Classics who made their portion of the airport parking area available the the B-17 and Dolan Auto Group who provided the car the the B-17 crew to use during their stay in Reno. 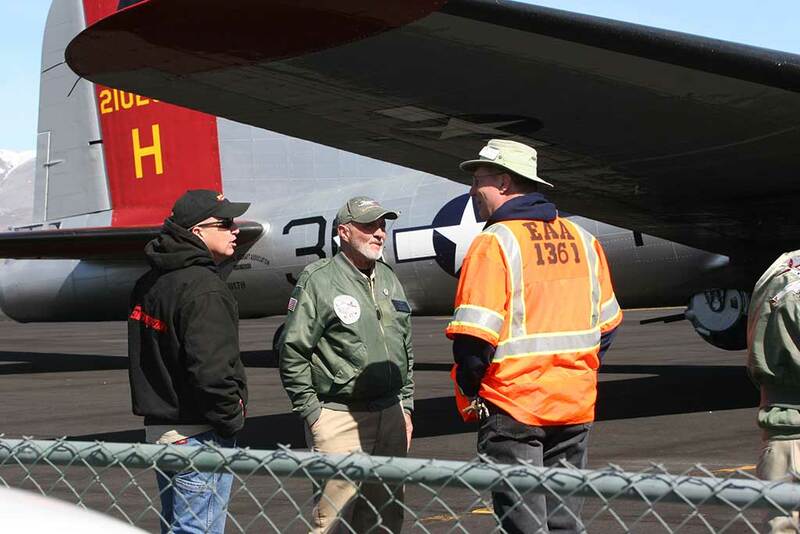 Randy and Mike listening in on the passenger briefing. 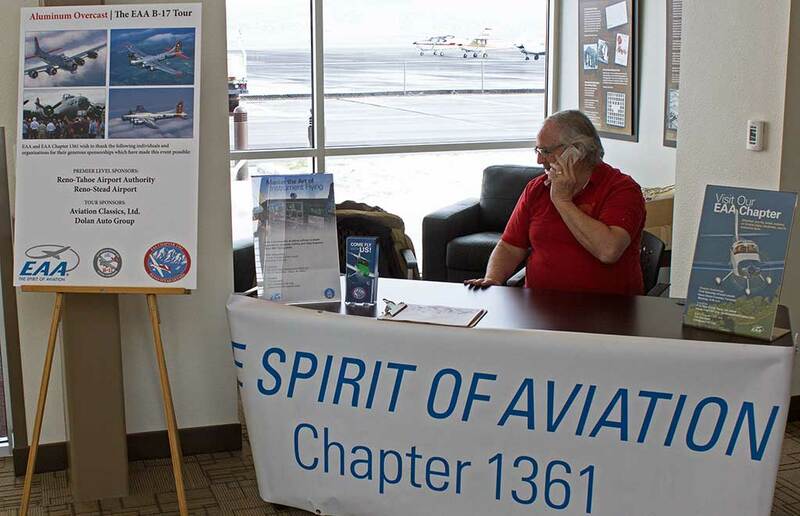 Tracy manning the Chapter information table in the Stead Terminal lobby. Frost on the B-17 just after sunrise. 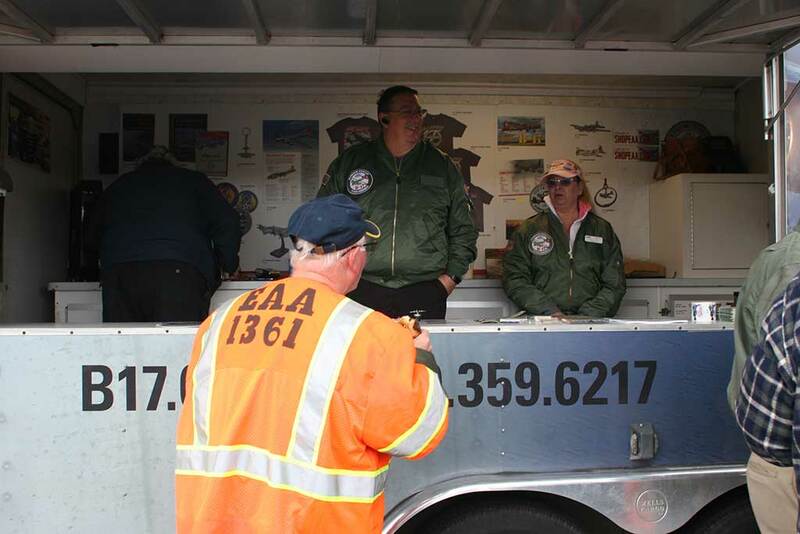 Greg, Steve and Bill manning the EAA merchandise trailer. 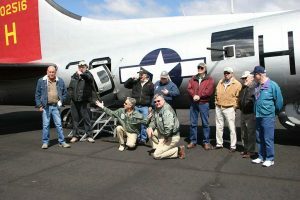 Pilots Tom and Ken with the next group of passengers. 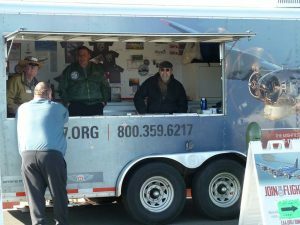 Morning donuts at the merchandise trailer. 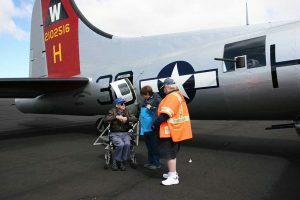 Dennis talking with passengers after their flight. 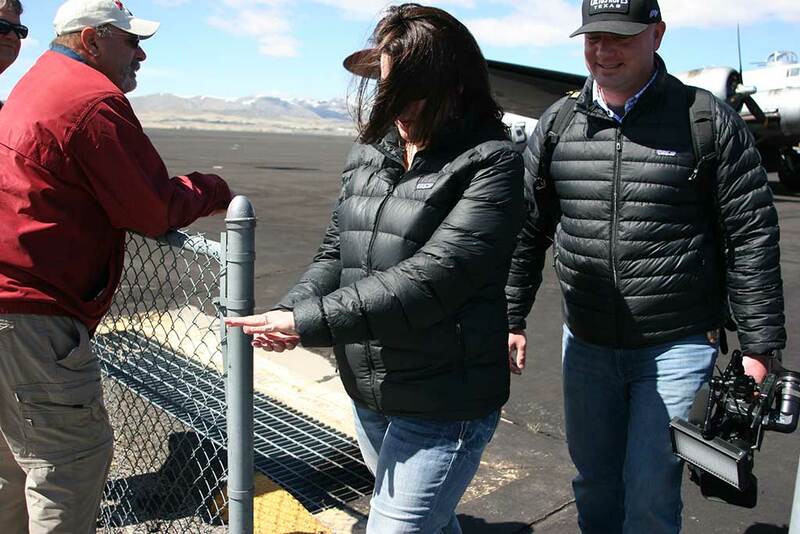 They got engaged on the flight! Fred, Dennis, Diane and Steve in the merchandise trailer. 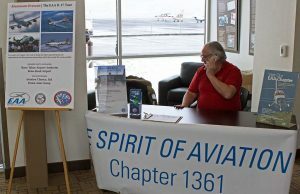 Fred, Mike and Tracy at the Chapter information table in the terminal lobby. Greg and Jack taking a break between flights. Greg, Steve and Bill working in the merchandise trailer. 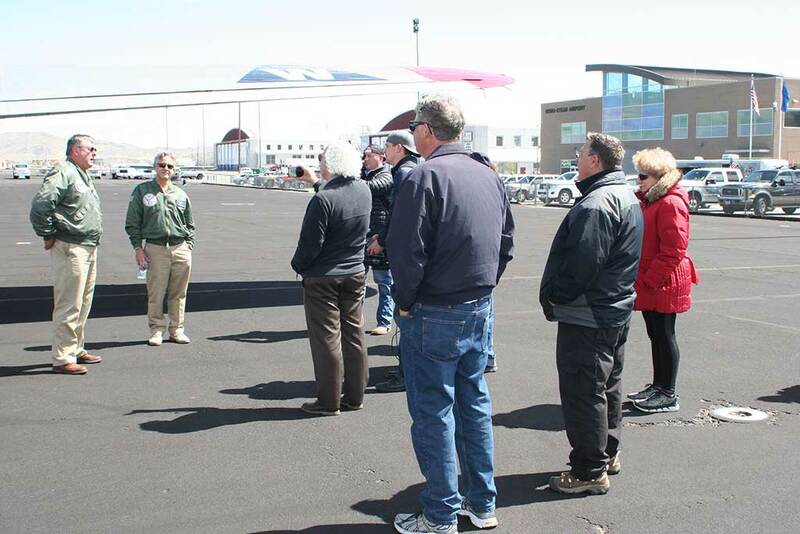 A crowd gathering for ground tours. Pilot Ken giving a B-17 history lesson. 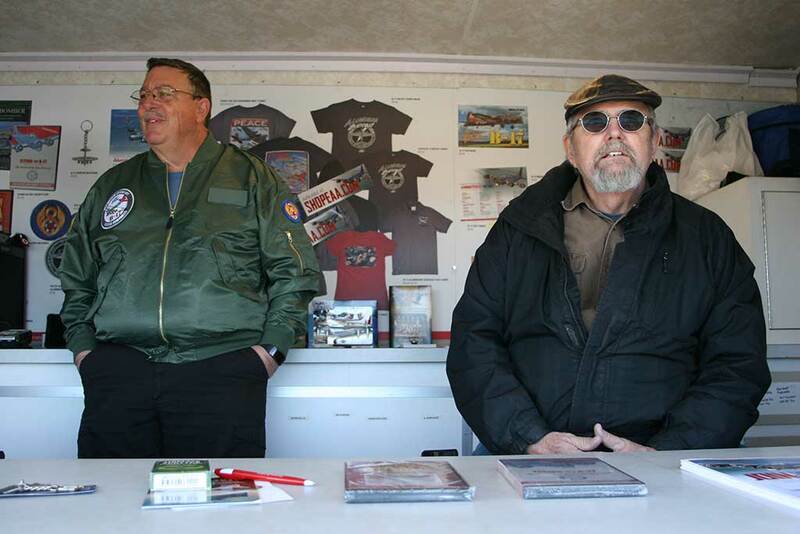 Pilot Ken and Mike in the ticketing section. 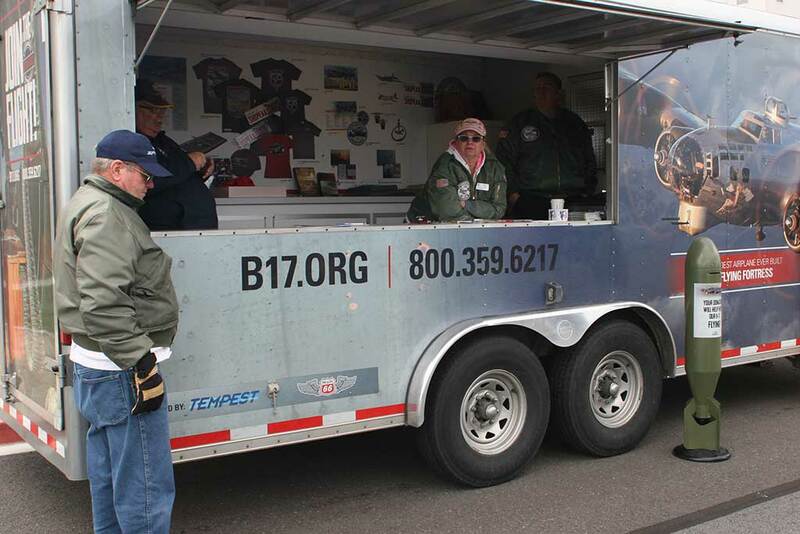 Ken and Tom briefing the next flight’s passengers on B-17 history. 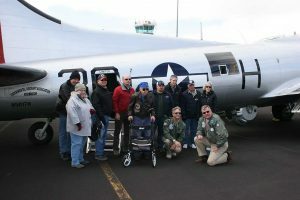 Tom, Ken and Rich with the Media Flight passengers. 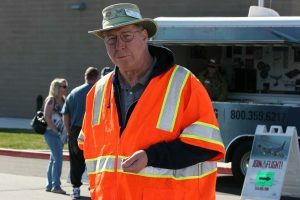 Mike trying to convince Diane that it’s a non-fat donut. 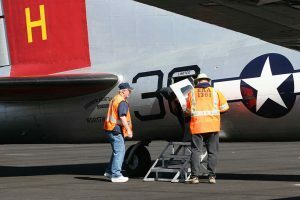 Mike and Mo removing the boarding stairs for engine start. Mike and Randy helping passengers deplane after their flight. 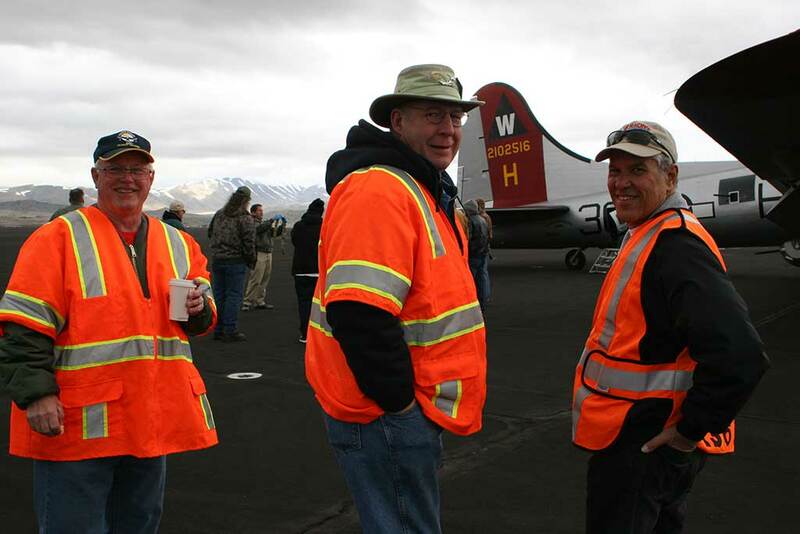 Mike, Randy and Jack pretending they’re hard at work. Waist Gunner view of Military Road. 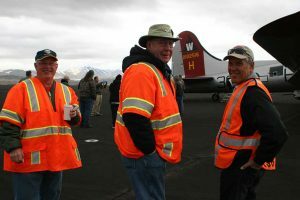 Mo, Mechanic Craig and Randy. 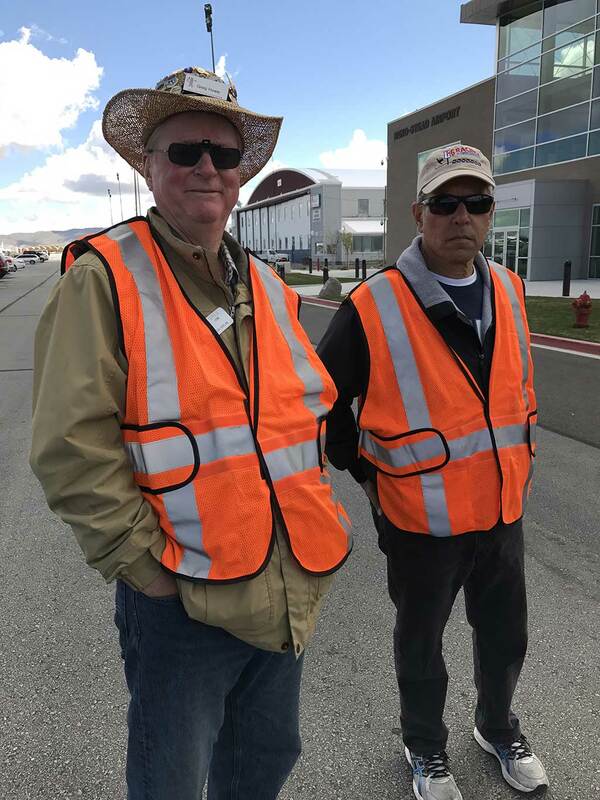 Mo and Mike monitoring boarding. Passenger briefing at the merchandise trailer. 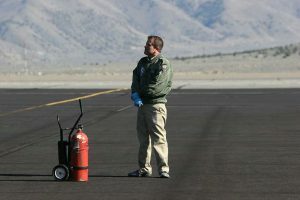 Pilot Ken getting ready for engine start. 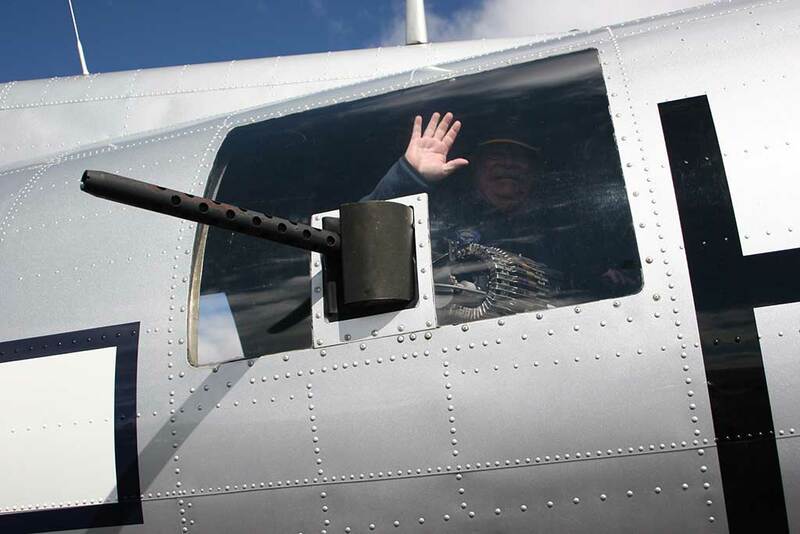 Randy really enjoying the photo op. 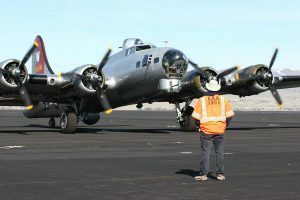 Randy waiting for the engine warm-up and taxi. 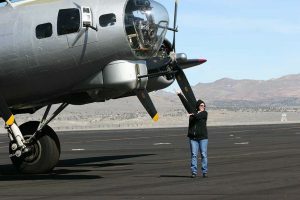 Mechanic Rich and an enthusiastic passenger. 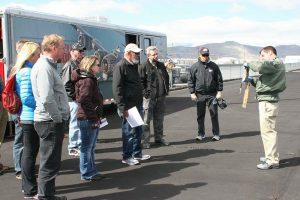 Rich giving the seatbelt briefing. 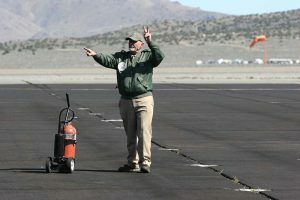 Flying Mechanic Rich ready for engine start. 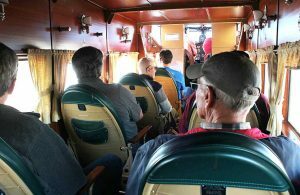 Tom, Ken and one of the groups of passengers. 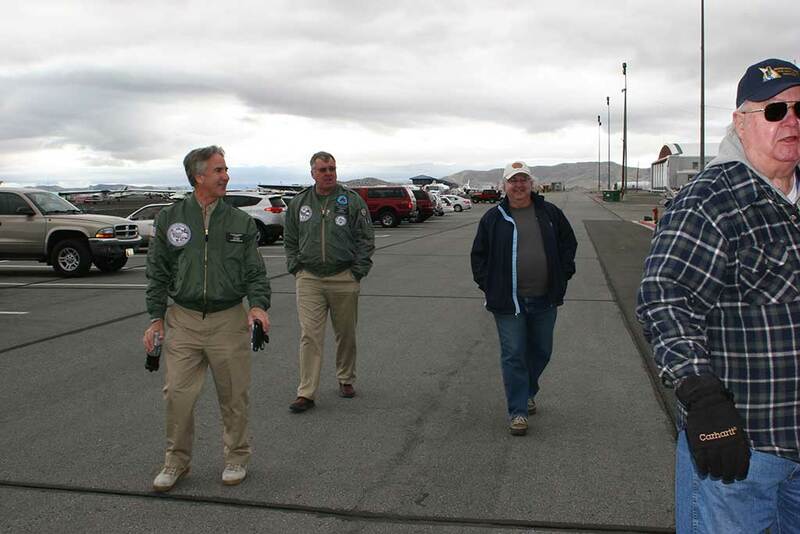 Tom, Ken, Tracy and Gene getting ready for the next flight. 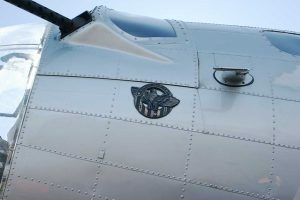 WWII emblem on the left side of the B-17’s nose. 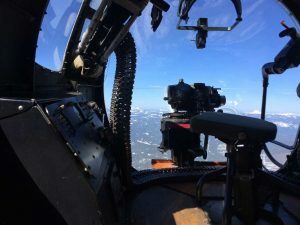 B-17 Ball Turret Gunner position. 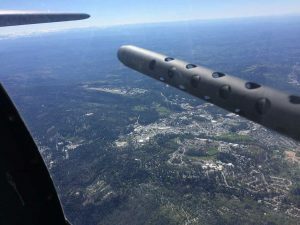 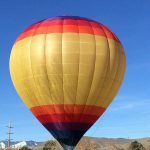 Flying top cover for Grass Valley, CA. Left nose gunner and bombardier stations. Paula working Randy’s shift in the merchandise trailer.